I’m so excited about this next post. It’s my favorite transformation to date and the ironic part is that I’m about to reveal our brand spankin’ new laundry nook and I’m not even the one who does the laundry (it’s the twenty first century, people!). The fact that we cobbled this new laundry area together on a budget just makes my chest puff up with pride. It has worked wonders on updating our house and laundry has never been more fun for my hubby (sorry babe, your love of doing laundry is now public knowledge). Life is good in our little laundry nook. And we’d love to hear about how you’ve organized everything from your laundry room to your attic- we have about 20 other corners, closets, and crevices that could benefit from a little organization so let us know what works for you. Hi ~ I just happened upon your journal while searching for kitchen design. I followed the link to the before/after gallery ~ you have done a wonderful job on your home. Very nice ideas ~ thanks for sharing. This post was awhile ago, so I hope yall see it. I love your laundry nook. We have the same washer & dryer and I’m dying to get some sort of countertop to go on top. I think using plywood is an awesome budget friendly idea. Did you anchor it to wall at all? Our washer can vibrate intensely sometimes when it spins, so I want to give it an inch or so of clearance under the countertop. Do you have this issue? I love what yall have done with your house! Beautiful! When we first concocted the idea of a plywood top we had grand plans of anchoring it to the wall so that it floated about 2 inches above the washer & dryer (leaving room to slide in an ironing board for storage). But we ditched that idea when we discovered the studs in those walls are not conveniently placed. Instead, we covered the top of the appliances with some rubber drawer liners (the kind you put in your kitchen cabinets to keep things from sliding around) and placed the plywood directly on top of those. It not only keeps the wood from moving, but also makes sure we don’t scratch the top of the appliances. We definitely get some vibration from our washer, but I’m not sure I would call it “intense.” (Although it does sometimes make those picture frames fall over.) My recommendation is to try plywood directly on top first and if the vibration make that not work, turn to suspending the wood above it an inch or so as a back-up plan. Using drawer liners is a great idea. We have some laying around already and it would leave less chance that the plywood gets installed not level (sadly, highly likely for me). Thanks so much! Hi! Again, another comment on a long ago post… but I had visions of doing this exact same thing to my laundry room when we move into our new (OLD) house next month. And lo and behold, here is your blog with my idea already done! I would have never thought of those rubber drawer liners, I was getting all complicated with wall mounting… thank you! Also, for the picture falling problem, why not try a plate rail type thing? Tack on some small molding to keep them in place! Thanks for all the great ideas – in addition to this one, I think you’ve convinced me to reign in my wild color palette plans in favor of something more unified. Though our home is 1680 square feet, it’s 3 floors of small rooms, so keeping it unified is probably best. Good thing my brain has a month to adjust to that idea! You’re totally reading our minds here! First the same idea for your laundry nook and then the suggestions for the molding to keep the pictures in place! We actually attached a piece of quarter round to the back of the plywood “counter” about six months ago that acts as a rail or a lip that holds our pictures in place! Good luck with your new old house! And definitely send us your before and after pictures! I don’t know how I stumbled across your site, but so glad i did. You have great ideas and have carried them out beautifully. Pat yourselves on the backs. About the laundry room: I also have full size front loading washer/dryer, with the pedestals, and they are so deep (and tall). Did you install shelving or was it previously there? How do you access the stuff up there? And what are the blinds attached to? Great job! The shelving was partially already there. It was a bit too deep for our taste (it protruded out further than the washer and dryer) so we removed a bit of the wood to shorten the depth and then cleaned everything up with sandpaper and some caulk and then painted the whole thing white. Then we screwed the bamboo blinds right into the ceiling using plastic anchors to reinforce them. Since the blinds are meant for either inside or outside mount, they have the capability to be attached at the top (they’re meant to be attached to the top of a window ledge, but we just used the ceiling instead- and it worked like a charm). Hope it helps! I just came across your blog and I love it! Esp love this post about the laundry room – I’ve been trying to figure out how to make mine look cleaner and more streamlined and this is totally the answer! Thanks for such great ideas! I. LOVE. Your. Site. I know that punctuation is *awful* but that’s exactly how I’d say it if I spoke with you both face to face. It’s wonderfully generous of you to allow us into your homes and lives, and to dole out some bomb-diggy advice in the meantime. I’ve been reading some of your posts, and am happy to say that I just started composting (in a ginormous trash can from WalMart — made of RECYCLED plastic no less! ), and I will be painting my kitchen hopefully next month. I’ll be sure to send you some awesome before & afters of that. Take care!! Hey Youngsters! I just found your site today after having a little meltdown with my husband. I just got so frustrated being young in our old (85) house…we spend so much time wanting to not mess it up that we’ve been afraid to really make it our own. Today it was about painting the woodwork. We have woodfloors, wood trim, wood mantles…I’m living in a lodge! When I showed him some of your pictures of painting/updating fireplaces he really got it. Thanks for the assist. We picked up our rolling cart in the storage / tupperware / laundry section of Target a while ago, so I unfortunately wouldn’t be surprised if it were discontinued. I did a quick Target.com search for it and didn’t see it come up, although they have a decent selection of rolling wire carts if that’ll work as a substitute. If not, you may be able to find something similar at Bed, Bath & Beyond or even Home Depot. Let us know if you’re able to dig something up. Good luck on your hunt! This comment is to Yvonne and any one else who is interested. I saw that exact rolling laundry cart at Lowes just last night. It was $24.95. I immediately snatched one for my own. My husband and I just bought our first house together (after nine years of military/apartment life). Your site has been so inspirational and helpful. It has settled a lot of design arguments we have had. Thanks so much for all the hard work you put into this website! Thanks so much for the helpful laundry cart tip and the kind words! Happy home improving! yay thanks Toni! We made a trip to Ikea to Woodbridge Va over the weekend and got curtains for the laundry room..now im so excited about the rolling cart! thanks!!! I am looking to buy a washer and dryer and have read some bad reviews of front loads… do you like the washer and dryer you bought and what brand/style is it? Our washer and dryer are Whirlpool Duet Sport appliances, and we love love love them. It’s so great to have a counter on top to fold and work on, so we really feel like we maximized our little laundry room and got so much added function thanks to the front loading feature. Hope it helps! You guys have done an amazing job on your house! I just love everything about it. It’s great to see such great design on a budget. It all looks very high end. Question about the plywood. Did you do any sort of finish on the edge to get it smooth, or did painting/poly it take care of that problem? And what width plywood did you buy? Thanks and keep up the GREAT work. I really enjoy the site. Thanks for the kind words! We actually just grabbed 1 inch plywood and sanded the edges a bit before painting and polying for a smooth look. It really has held up well and we love the convenience that it offers us for folding and putting down shopping bags when we come in the door, etc. Hope it helps! Good Idea with the counter top over the washer and dryer. I would like to know if the counter top is free standing or sitting on the appliances. Do you have end wall brackets to hold the counter in place. We actually “secured” the counter above our washer and dryer with one of those grippy rubber pads that are meant to go under area rugs to keep them in place. We purchased the thickest one we could find at Home Depot and cut it to fit the top of the washer and dryer. The genius thing is that it’s not like glue (and it wasn’t nearly as difficult to install as brackets would have been) so it’s 100% removable in case we ever need to move/relocate things (but the grip pad really keeps everything from shimmying and sliding on a daily basis). Hope it helps! John & Sherry, this is such a great idea for the laundry room! We seem to have a similar setup, but if we get a rolling cart, that would take up the space where I usually put my ironing board. I’m curious about what you ended up doing with yours? Our ironing board actually slips between the small space between John’s Ikea wardrobe and the wall in the bedroom (since the curtains that drape in front of the wardrobe cover that space, no one’s the wiser). Hope it helps! Love your laundry nook! I see where you’ve already commented about where you store your ironing board BUT what about mops, plunger, bathroom brush, mop bucket, and broom? I seem to have trouble finding good “hiding” places for these items. Thanks so much! Hmm, we don’t have a mop but we do have a swiffer that we stick in that tiny gap where the ironing board is. Basically it’s our one tiny spot to stick things that are tall and vertical so finding a space like that is key. What about in the back of a closet or even under a big queen or king sized bed? Hope it helps! I love your site – just happened upon it the other day. Our “laundry nook” is actually in our hall bath and since front loading appliances prevent putting doors back on, i love the idea of bamboo blinds. I see that you have 2 sets of blinds side by side, but is that one valance at the top? My measurements are 60×80. Thanks for sharing all your ideas – it gives me the boost of confidence to try something new. Nope, no valance- the top flap that you see is part of the blinds, so there are just two blinds next to each other hung at ceiling height. Hope it helps! Our Duet Washer is about a year old. It shakes a lot. After reading your site, I’ll try to put the “gripper, rug” padding under the washer. That may stop the “walking” on our tile floor. Do the blinds go all the way down? Our new place’s entry is literally right into the laundry room OR the playroom. I’m having a hard time trying to figure out how I’m going to make this presentable. I’m assuming that the kitchen pathway (literally… you walk in to a small space & stare at our washing machine/dryer (i guess it’s sort of a laundry room but not really….) and then you turn left to the kitchen nook, then right to a skinny kitchen. eeeeek!) will be the best “path” since the play/art room will be patrolled by my two year old & god knows the mess he likes to make. Should I put up curtains or ?? to cover the washer/dryer? Or would you think that I should go the playroom route? Hmm, the blinds aren’t long enough to replace doors (they do go to the tops of the washer and dryer but not to the floor) so I think the curtain route would be a great idea. They can be pulled open and out of the way (instead of doors, which fold out into your pathway) so they’re probably the way to go. Hope it helps! SWEET! Thanks!!! That’s what I was leaning towards but just wasn’t sure… it’s nice to have a professionals opinion!!! Now if only I can talk the bf into front loading washer & dryers!! Have you ever gone to a furniture auction!? We can get front loaders for about $400 there! My mom just bought a new crate & barrel couch that is AMAZING for $50! I’m sort of obsessed and figured you would think it’s just as sweet!! Thanks again for the confirmation! I get tons of ideas but am too nervous to do it! Nect question. I am looking for 2 club chairs like you have sitting in your den next to the fireplace. Any idea where to find them on the cheap? I am trying to redo my master bedroom on a very small budget….and kind of shabby chic….. Thanks a TON and I will be back! So glad you found us! That chair near the fireplace in the den is from Ikea! Totally cheap and comfy (here’s , and we snagged a for it for more of a casual washable look). As for the non-limey green tone for your bedroom, I’d try Benjamin Moore’s Limestone. Gorgeous! Hope it helps. I love the idea of using the bamboo shades to hide the mess on laundry shelving! I am wondering if you use yours much? I have to access all of my soaps and supplies from the shelves everytime I do laundry and feel a little apprehensive as to how well the shades will hold up? Thanks! I’d say we lower and raise them at least once every few days to get to something stored above and over a year later they’re still showing zero signs of wear and tear! Hope it helps. i love the idea of your laundry room and how open it is. we just bought a new (old) house and the laundry room is in a large bathroom in the finished basement. we are getting a the frontloading washer and dryer. do you think it would look ok to not have doors like you do even though it is in the bathroom. we will be using the bathroom a lot as well as any visitors or guest. 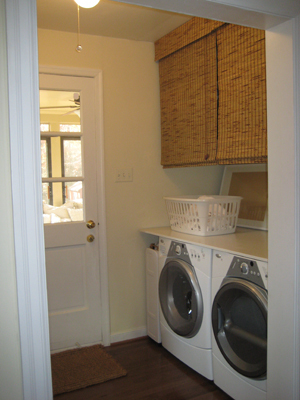 It’s really subjective but we think our laundry nook is cute! It’s actually the first area guests pass through to get into our house from the back exit (which is the way 99% of people come into our house) so if it’s something that greets them it’s certainly eye-pleasing enough for a bathroom in your home. Our advice would just be to keep it as tidy as possible so guests aren’t staring at dirty underwear or muddy clothes! ok – using the grippy rubber pad thing to hold the plywood in place is genius! We are building a new home and have a laundry area that I wanted to add a counter top to, but I think I will try this first. My only concern is that we have one of those ugly laundry sinks next to the washer and dryer. So ugly, but so functional. I have dreams of having a large counter that goes across the washer and dryer and then has a new, large sink built in. Oh, if money only grew on trees! Any ideas on how to deal with the ugly sink? Could you cut out your counter to rest around the lip of the sink so it sort of looks seamless and “undermount”? That’s our only idea. Either way, good luck with everything! Our grippy rubber pad is still holding fast over a year later! Good idea! We will give it a try when we move it. I will send you pics if it works! Thank you Thank you! My husband and I have just painted our laundry room and are trying to get it all set-up. I love the idea of having blinds to hid all the extras. I’ve looked for them at Walmart but have not had any luck. Did you have to order yours from Walmart.com? Do you remember the name / type of the blinds other than bamboo? Ours were available right in the store, but we’ve heard that some regions don’t carry them in-store at all. We don’t remember the name/type offhand, but we have heard that Target stores carry extremely similar versions so perhaps that’s another place to look. Hope it helps! I just found a washer dryer Worksurface made by Whirlpool. It’s removable so it makes servicing the appliances easy and it sits directly on top. Check it out. I’m so excited because this will give me additional counter space in my kitchen where my w/d live. I am SO stealing this idea for with my grungy laundry area this weekend! I have been trying to figure out how to hide the ductwork and ugly pipes since we moved in a couple months ago. This is perfect! My friend used framed, blown up laundry symbols for art in her laundry room. hey, j & s! thanks so much for sharing your life (both the DIYing side AND the baby havin’ side) with all of us in the cyber world. it is both inspiring and amusing. a question regarding your laundry nook “counter”: i’d like to make the same sort of counter for my nook, but as a DIY newbie, am nervous about “polying” something. i’m not even sure what that means exactly. could you guide me to a “laundry nook counter for dummies” website (or better yet, a post you already have on your blog) where i could get some details on this process? thanks so much! We just used this process for painting furniture when it came to our laundry room’s plywood counter. Definitely grab the poly we mention by name so you don’t end up with something that’s yellowed and dirty looking (some poly is notoriously bad about going on clear). Hope it helps! Hi there! I love your blog and I see that you have a front-loading washer…did you do a lot of research before you bought it? Would you mind saying what kind you have? I might soon be in the market for a new set…since my old washer seems to be disintegrating from the inside, and would love to hear any advice. 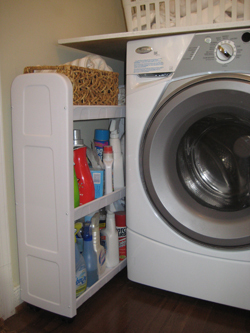 Here’s a post with the specifics about our washer and dryer. We were looking for a smaller footprint (to better fit into our nook) and read a few reviews first but mostly we trusted the name (Whirlpool) and the price was right. Years later we love our choice and John’s sister actually followed suit and got the same ones and loves hers. Hope it helps! Thanks for the info, and you two are so adorable I could just eat you up. Happy holidays! 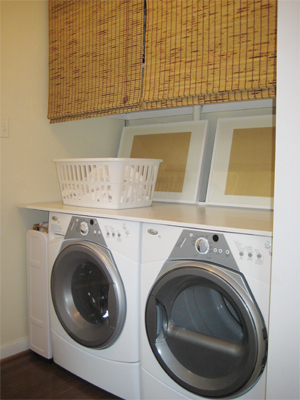 Love, love, love your laundry renovation! My husband and father-in-law just added an extra self in our laundry room today and we are hoping to add some blinds thanks to your inspiration. Do you remember the specifics on the blinds you purchased at Wal-Mart? Thanks for your help and your brilliant blog! Thanks for the kind words! As for the bamboo blinds, all we know is that we picked them up in the store and not online. There has recently been a huge blind recall so you might have a hard time hunting them down immediately but hopefully you’ll find them sooner than later. Good luck! p.s. My hubby and i got married on 06/07/07 as this was the anniversary of when we started dating! Ours does have a vent to send the hot air outside but it was actually run through the wall and under the floor before we moved in (so it doesn’t need to be near a window and it’s completely out of sight). Hope it helps! When you made the counter top out of plywood did you attach it in any way to the wall or just lay it on top of the washer and dryer? I am looking to do the same thing since we recently got a front loader. Thanks! We just laid it on top of the washer and dryer (since they were exactly the same height) and used a grippy rubber rug pad to keep it in place. Years later it still works like a charm, even when we’re spinning something super fast it stays in place. Hope it helps! I want to thank you for the great idea for my laundry area. My laundry area is the first thing I see when I come in from my attached garage. I was fortunate enough to have built in wall cabinets so I had a hiding place for the clutter but somehow it still looked yucky. The new painted plywood top has given me tons of extra space now and the pictures leaning against the back wall look great. It looks so much better when I come in every day. Plus we are able to use it as a serving area for snacks for gaming night in the man den. We’re so glad to help! Thanks so much for stopping in to tell us that it worked for you! Is your counter top flush with the back wall with cut-outs for pipes and what not? or is it a cople inches away from the back wall? BTW, Love the nursery colors!! It actually floats a few inches away from the back wall due to all the pipes, but thanks to all the leaning frames, no one’s the wiser so it looks clean and flush unless you remove the frames and study everything intensely. Hope it helps! I just have to say I love your blog. When my grandmother died in 2007 my husband & I bought her house, which is a red brick 1950s ranch very similar to yours so I really enjoy seeing all your ideas! Our laundry area is also similar to yours- bifold doors (but with a bit of wall on each side) and a narrow hallway from the backdoor to the rest of the house. We’ve decided to look into taking your lead and opening up the hallway by taking out the doors/wall of the laundry area. i’m totally stealing your topper idea! i so wanted the whirlpool laundry topper, but after buying a brand new washer/dryer pair remodeling the whole laundry room to accomodate my new beauties (pedestals, paint, tile, new cupboards and new door to the room and new outside door…) i couldn’t justify the $239 price tag! with the pedestals ours is too high for short me to fold clothes on… but it’s handy if i want to set something on top of it and the plywood/topper will protect the tops from dents if something in the cupboards over them falls onto the washer or dryer!!! oh i SO love all the ideas i get from you!!!!!! Hi- Love the laundry nook! When you installed your front loaders did you switch your washer/dryer positions, and if so did you just run longer hoses/vents? Ours arrive tomorrow, and we are trying to determine if it is safe to switch the positions, and have the connections criss-cross (so they both open to the outside)in our tiny laundry room!! That was suppose to read …..switch the positions(so the doors both open to the outside), and have the connections criss-cross! Yup, we did switch their positions so the doors open towards each other for maximum ease of loading and transferring. We didn’t even have to get longer hoses or vents, the ones that were there easily reached since it was only about a foot in each direction that they had to be swapped. Hope it helps! Wonderful blog! It’s full of inspiration. I was wondering how did you put the plywood counter over the washer and dryer? Just scroll up for that info! Wow. I’m inspired and impressed! Do you have more information about the wallpaper art? Or wrapping paper was it? Boy howdy I have a short memory. It was regular old tan on tan subtly striped wrapping paper from Target. So cheap and so easy. Hope it helps! I had the room painted of a tone of green-blue (I don’t know the exact word in English), bought white cabinets and put some green and light blue baskets to organize my things. The baskets I found here: . It became really good!!! If I have time, I take pictures and send them to you. We’d love to see photos anytime! I love your site, your home, the two of you, and everything you guys put your hearts into. You continually inspire me to make my home better. I am wondering what color you used on the walls of your laundry room. I love the clean, airy look and feel of it. Thanks! Thanks Shay! It’s Wishes by Glidden (they might not make it anymore so you may have to ask them to look up the formula on the computer). Good luck! Sure thing! Just be sure the blinds are marked “outside mount” and then you’ll be able to do what we did and just screw the brackets right into the ceiling using anchors. Hope it helps!